My postman has just called with two amazing parcels from a very special lady. Most of you will know Tricia from Tricias Confetti and my parcels are from her today. I have filled my ironing board to overflowing with all she has sent us. It includes. 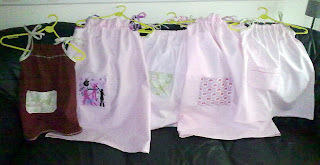 to be used for the little dresses we are making for the Dress a girl around the world scheme. It is such a truly generous donation and we will make big efforts to get little dresses cut out and made as soon as we can....life just seems to have got in the way for me lately but I promise it will all get used in time. What gorgeous bright colours too. Thanks so much Tricia. Yesterday was spent filling my 'to do' rail with work while I had special 'Nanny Annie time' with M and her gorgeous twinnies so today is a catch up Friday to clear my sewing mountain. Hope you all have a great weekend. Ooo gorgeous fabric - I have Sue's fab quilt which will go beautifully with some of that plain fabric - Fun day Monday is going to be a busy one. Hope you manage to plough your way thro your to do rail as quickly and easily as possible so you have time to chill a bit today. Hectic weekend for you too!!! Never actually counted what was in there but look forward to seeing what you manage to do with it all. Got lots of room in my airing cupboard now!! Im just so surprised that you still manage to find some time to make these adorable little dresses! Such a colourful selection the postman has delivered, there's no end to it all! How wonderful! I am a mother of 3, nanny to 3 beautiful granddaughters and 3 gorgeous grandsons and lived in a little village in Shropshire until August 2014 when we moved to a little bungalow in Shrewsbury and nearer to our gorgeous family. Although a nurse and midwife by trade, after a career break to bring up my children and 16 years of child minding [my own 3 and 35 extra little darlings] I have retrained as a tailoress and now run a very successful sewing business from home. ANZAC Day + CAS STencil Challenge.. just! WOYWW # 516 What's On Your Workdesk Wednesday. 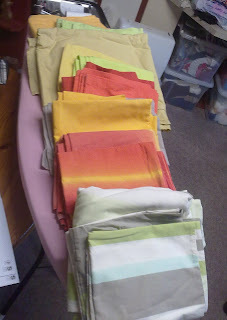 It's fun to be a LillyBo quilt maker! Please copy and paste image and pass on some love. Click on heart to find out more.